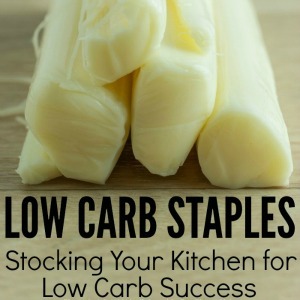 Want a tasty low carb meal that’s super easy to prepare? 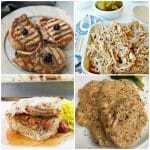 As you know, we love low carb pork recipes around here. 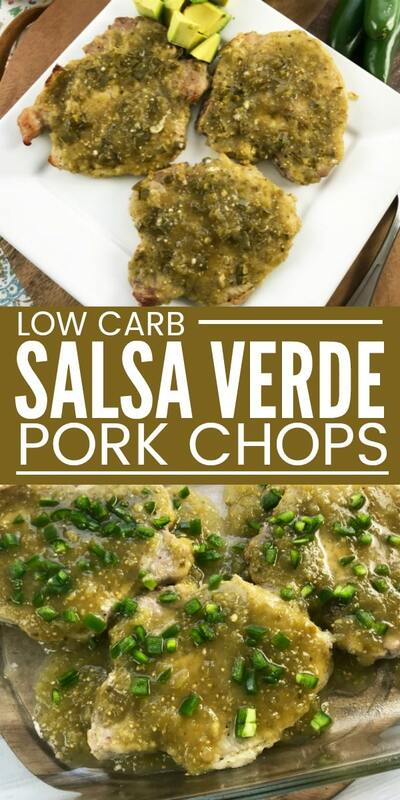 These salsa verde pork chops now a favorite when we’re craving a spicy Mexican dish but don’t want to give into the carb-laden chips and rice that are served at our favorite restaurant. Pair this pork salsa verde with a green veggie and a big mound of riced cauliflower for a complete meal. 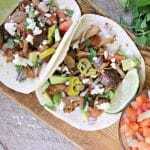 Before we get started, you should note that you’ll need thinly sliced pork chops for this pork salsa verde dish. Ours were about half an inch thick, but I believe traditionally 1/4 inch pork chops are a better fit. 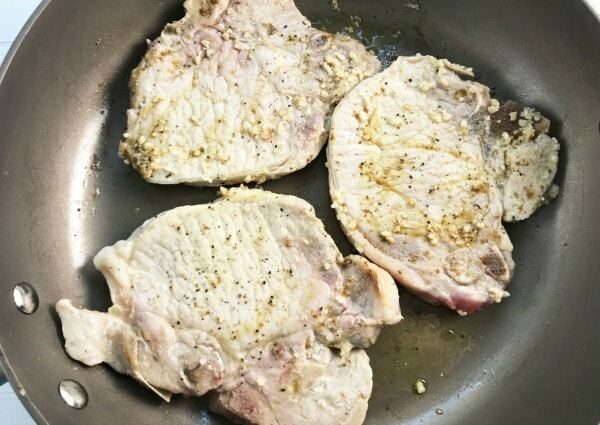 If you go thinner than 1/2 inch thick pork chops, however, you should adjust the cooking time in the oven accordingly to prevent drying the pork chops out. 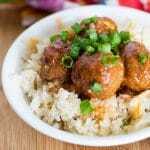 Our Crock Pot Asian Pork Chops are a reader favorite! 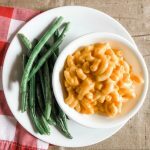 Try this recipe in the crockpot for an easy weeknight meal. 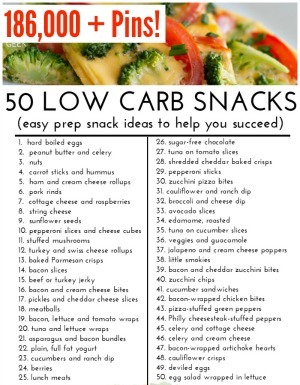 Need a meal in 30 minutes or less? Make this Pork and Broccoli Stir Fry in a pinch. 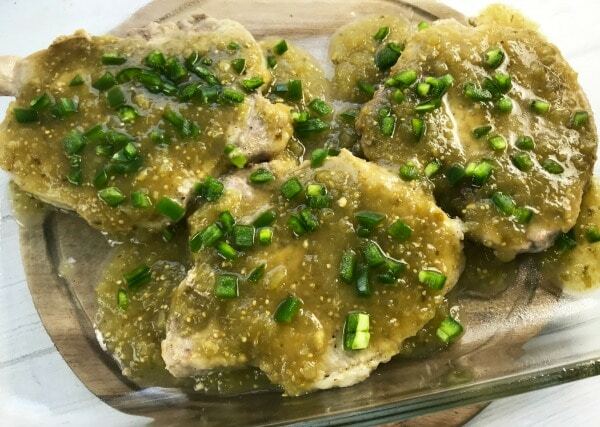 This recipe for pork chops with salsa verde is made even easier by using a bottled sauce. Be sure to check whatever brand you’re using to make sure there are no added sugars. We like this brand which has one net carb per serving, so keep that in mind when you’re counting your carbs for the day. Start with a hot skillet with the olive oil and garlic. Season the chops with salt, pepper, and cumin on both sides. Brown the pork chops on both sides, cooking no more than a few at a time. Be careful of splatters, which are common when quickly searing meat at high temperatures in oil. One the chops are browned, place them in a baking dish that’s been coated inside with non-stick cooking spray. 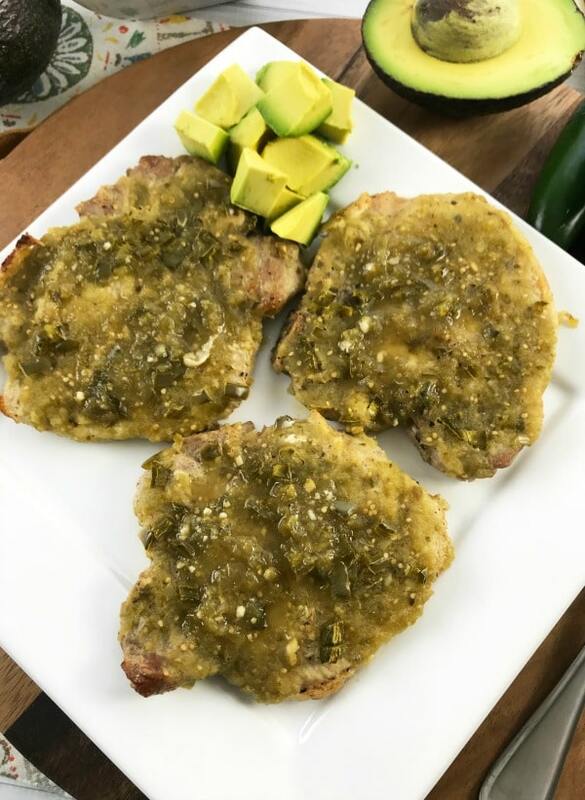 Top the pork chops with salsa verde and chopped jalapenos. Remember to be careful to avoid touching your eyes or face while working with jalapeno peppers. You can eliminate the jalapenos if small kids will be eating these, as it may add a little too much spice. Bake at 350 degrees for about 25 minutes. Adjust the cooking time if your chops are thinner. Serve with a side of cauliflower rice or Mexican or a simple savory rice, if you’re not watching your carbs. 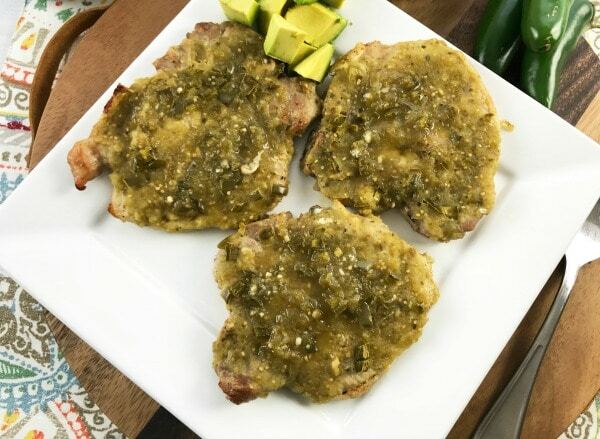 If you’d rather eliminate using the oven altogether, you can finish off these pork chops with salsa verde right in the skillet! Just make sure you’re using a large skillet to give the chops enough room to soak up the sauce. Cook for about 15 minutes to allow the salsa verde to reduce and thicken, allowing it to stick to the meat. 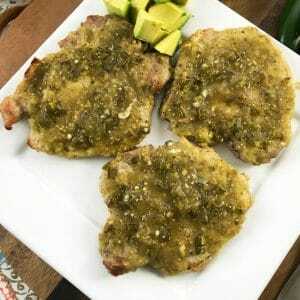 Bottled salsa verde makes preparing these salsa verde pork chops a cinch. 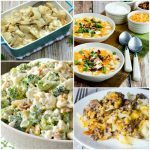 You'll love how easy this flavorful, delicious meal comes together! Preheat the oven to 350 degrees and spray an 11x7 baking dish with non-stick cooking spray. Heat the olive oil and minced garlic in a large pan. 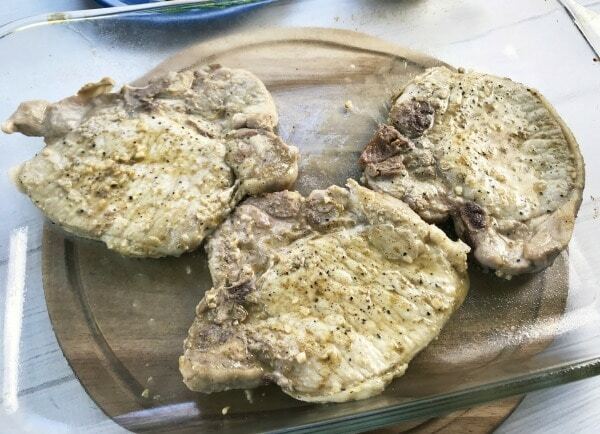 Brown the pork chops on both sides and season with salt, pepper, and cumin. Remove the pork chops from the pan and place in the baking dish. Pour the salsa verde over the pork chops and top with diced jalapeno. Remove from the oven and serve with diced avocado, salad or riced cauliflower. 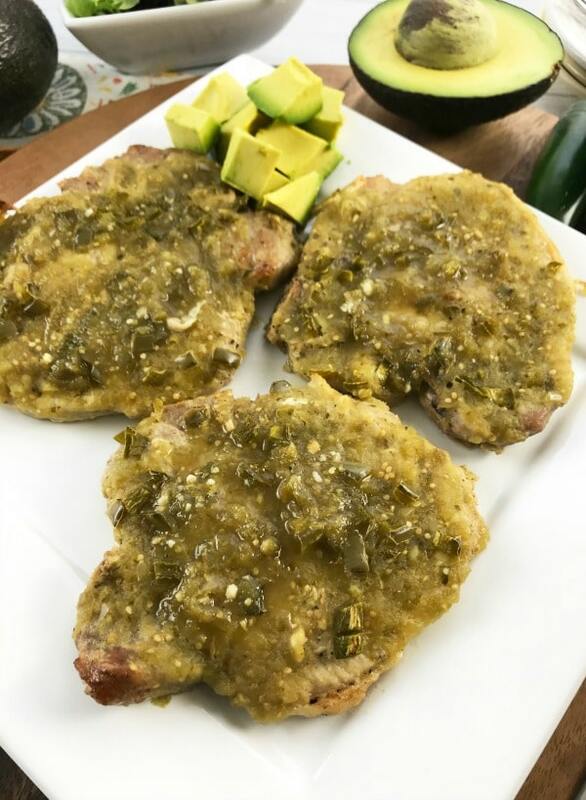 Remember this recipe for salsa verde pork chops by pinning the image below!